The proposed noise ordinance has Whereas clauses that justify the proposed ordinance. These are not carried forward into the actual municipal code. There are four Whereas clauses that discuss how sound is harmful to residents, but there is another Whereas clause that discusses how the City intends to treat the commercial establishments who have helped the City prosper. To protect the bars, restaurants, and cafes, Mayor Kriseman is gaslighting residents and throwing residents under the bus. The City had spent $5,700 to hire an acoustical noise expert to study the downtown noise and mechanical noise. The three acoustical studies identified downtown St. Petersburg noise issues. The bar, restaurant, and cafe's excessive noise has caused residents to experience medical issues related to noise, such as, stress, anxiety, and increased heart rate. In 2013, According to St. Petersburg Police Department Incident/Investigation Report 2013-041269, police responded to a resident, who stated, "...that since Club Detroit opened, she has been "deprived of sleep" due to the vibration the club's music emits. She added that recently it has been giving her headaches and has been making her very nauseous. She said overall the vibration from the bass is affecting her sleep and physical well being." In the proposed noise ordinance, the City has four "Whereas" paragraphs recognizing how harmful noise is. However, the City refused to hire a medical expert to provide a report on the harmful effect noise has on adult and kids health. This would have also served to educate Mayor Kriseman, City Council, Police, City staff, business and residents. This could have been the basis for a community education and outreach program. While the proposed noise ordinance changes the penalties and adds motorboats, the time and distance requirements do not change for residents downtown or in the City's neighborhoods. With 2019 noise calls are trending much higher than 2018, noise is getting worse for residents in the City. The citation rates have dropped under Mayor Kriseman and are abysmal. Bars have filed lawsuits against three residents for calling the police. The last lawsuit was in 2016, Edge Partners d/b/a Flamingo Resort vs. Neff, which the Judge dismissed. The lawsuits have had a chilling effect on the community. Many residents have given up and stopped calling the police. 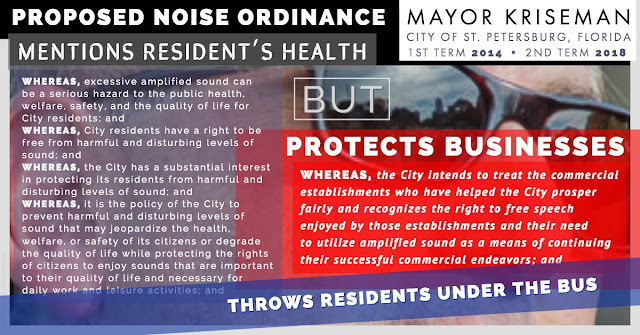 A Public Records Request exposed Mayor Kriseman's disdain for the noise ordinance. 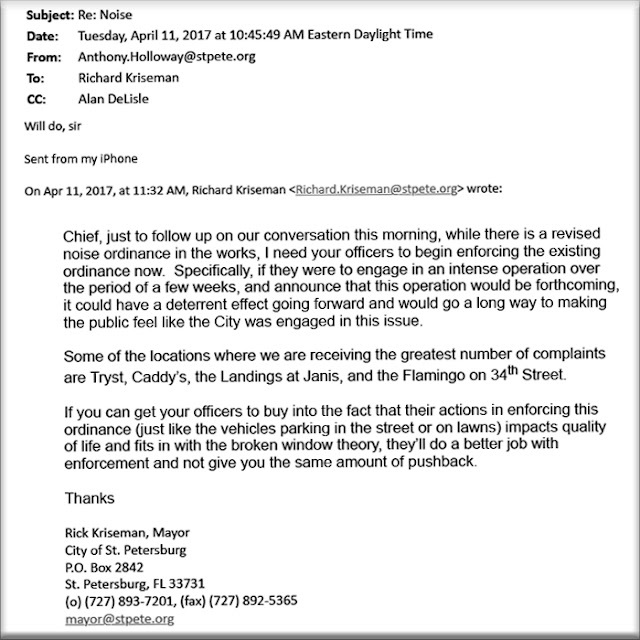 On April 11, 2017, Mayor Kriseman asked Police Chief Holloway to enforce the noise ordinance for two weeks in 2017. What were the police doing the other 50 weeks? What did Mayor Kriseman tell Police Chief Holloway to do in 2014? 2015? 2016? 2018? The four health-related clauses sound like the City cares, but, if Mayor Kriseman refused to hire a medical expert, how can residents trust the City to protect our health when Mayor Kriseman is not enforcing the noise ordinance and is recognizing businesses who have helped the City prosper? 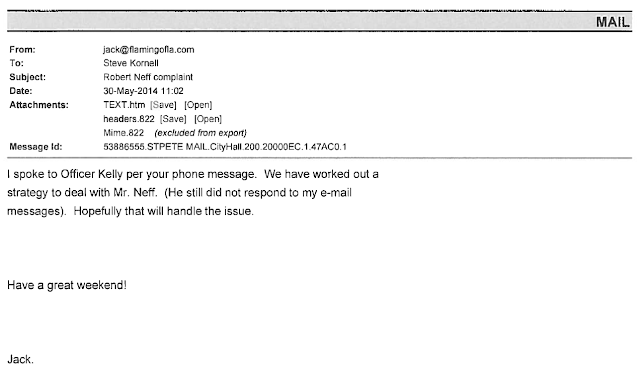 In addition to finding Mayor Kriseman's email, another Public Records Request provided several emails where Council Member Kornell, Police Community Service Officer Kelly, and Flamingo Resort owner, who is Board President for the Skyway Marina District, develop a strategy to deal with a resident who reported noise to the police, and Mayor Kriseman, and City Council. This email was not provided in the first Public Records Request, but was responsive in another request six months later. What else is the City hiding? WHEREAS, the City’s enactment and enforcement of the provisions of this ordinance shall be content neutral with regard to the regulated sound. Previously reported that January 2019 was trending higher than January 2018. The trend continued for first three months. 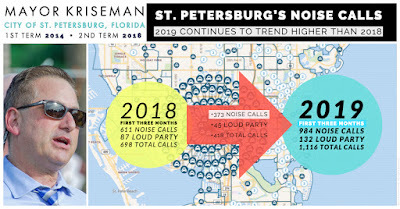 Where 2018 had 2,517 noise calls, 2019 could be over 4,000 calls. This would break the 2013 record and be the highest ever recorded under Mayor Kriseman's Mayorship. To view the calls on the City's StatMap, click on the link below. 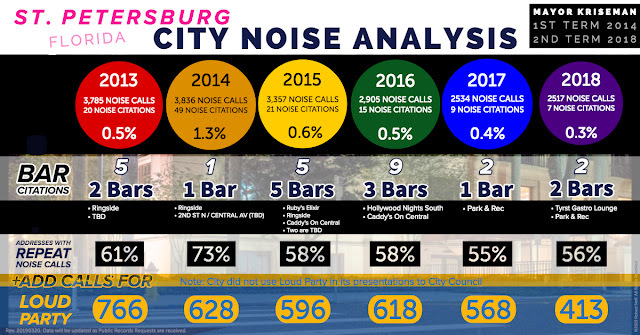 Will the increase calls impact the noise citation rate for the bars? Probably not, that is, unless the Mayor asks the police force to enforce the noise ordinance and issue citations to bars and residences with repeat calls. Until then, residents, vehicles and motorcycles are more likely to be issued a citation than a bar. While the data has proven the Police are not enforcing the noise ordinance, this email from Mayor Kriseman to Police Chief Holloway will help you understand why the City of St. Petersburg has an abysmal citation rate. The Mayor is selectively enforcing the noise ordinance to make himself look good. Appearance matters more to Mayor Kriseman than the resident's health and well being. But Mayor Kriseman is not alone in his quest to turn up the volume. City Council Member Kornell has worked with the Community Service Officer, and Flamingo Resort owner, who is the Board President for the Skyway Marina District. Together, they developed a strategy to deal with a resident who repeatedly called the police to report Flamingo Resort's noise. As expected, Commissioner Stacy White filed an Amended Complaint on March 22nd challenging the All for Transportation (AFT) 30 year $16 Billion sales tax hike charter amendment. As baseball season begins, it looks like AFT is thrown a curve ball as White's Amended Complaint brings forth additional information and describes additional issues with the AFT charter amendment. On March 14th, Judge Rex Barbas granted a motion to dismiss for Commissioner White's lawsuit based on a ruling that White did not have standing to sue the county in his capacity as an individual county commissioner. The dismissal, based on standing, had nothing to do with the material aspects or merits of White's legal complaint. Local media immediately published articles about the dismissal that day. However, it's been almost a week and we have not seen any reporting from local media about the Amended Complaint filed March 22nd. Maybe they are waiting for talking points from AFT to spin. We will provide links to actual documents and evidence related to the lawsuit that local media refuses to provide because they think such information is "not newsworthy". The facts are Judge Barbas left the already scheduled May 3rd Summary Judgment hearing in place when he granted the dismissal on standing and granted White 10 days to refile his Complaint - which he did on March 22nd. 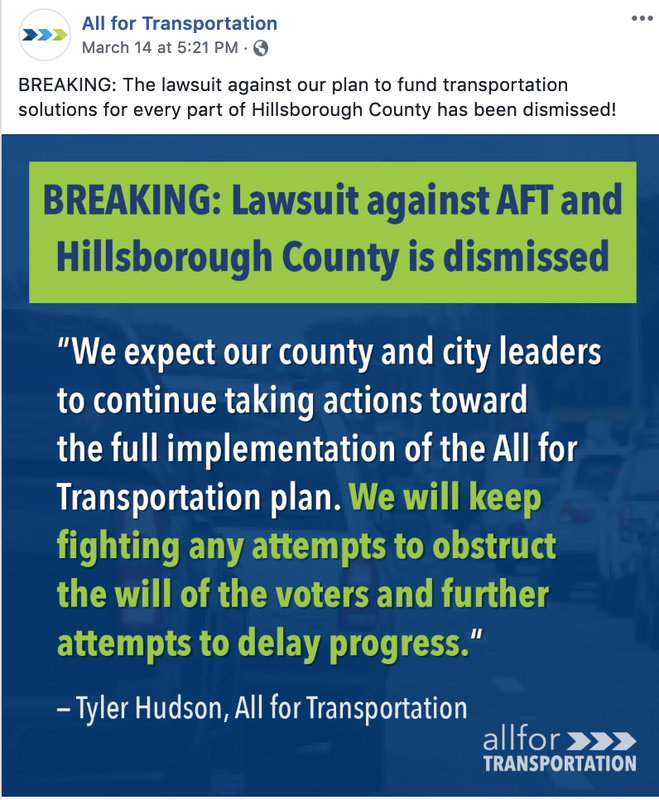 Misleading headlines about the dismissal were spread, including what was posted on the All for Transportation Facebook page. Like claims made by AFT prior to the election, AFT makes claims with no links or citations to their claims. AFT provides half-truths and are dishonest by not stating the case was dismissed on a rule of standing not merits of the case, and the case is proceeding as scheduled. Scroll thru and read the comments in this post from AFT supporters of the tax who think the lawsuit is done and over. AFT intentionally uses half-truths and selective filtering to play to those uninformed and certainly gullible to believe them. That's how they operated their $4 million deceptive marketing campaign. But as we posted here, while deceptive marketing campaigns may not be illegal, using misleading ballot language that misleads voters may be illegal, is certainly unethical and totally dishonest. AFT intentionally used deceptive ballot language that insufficiently informs voters of what is actually in the AFT 5 page charter amendment. The ballot language, which is the only text every voter is guaranteed to read before casting their ballot, has numerous conflicts with the fine print in AFT's 5 page charter amendment. The ballot language insinuates funding to "improve roads" that voters can reasonably conclude includes funding for new road capacity, is the highest priority projects funded by the tax. However, the fine print earmarks the tax proceeds to projects AFT wanted funded, specifically excluding and prohibiting the funding of new road capacity while mandating $7-8 Billion be spent on costly transit projects which will be built in the city of Tampa. White's Amended Complaint filed March 22nd can be found in Case 18-CA-011749 documents on the Hillsborough Clerk of the Court's website or here. Read the Complaint in its entirety as it is 37 pages of easy reading not full of legalese gobbledygook. White's legal complaint often refers to Florida Statute 212.055 that governs the local transportation sales tax. 212.055 section 1(d) clearly states: Proceeds from the surtax shall be applied to as many or as few of the uses enumerated below in whatever combination the county commission deems appropriate." 212.055 also states that it is the governing body, which is the county commission, who has the authority to remit tax proceeds to a transit authority or other transportation authority. White has standing as a taxpayer but the charter amendment also prevents him and all other current and future commissioners from advocating to fund transportation projects their constituents want/need in their district or in the county overall. Transportation projects to widen roads or add new road capacity, which Florida Statute 212.055 clearly permits the tax funds can be used for, is "essentially impossible" to fund - for 30 years - under AFT's tax hike charter amendment. AFT's specific appropriated funding mandates with strict prohibitions of funding new road capacity inhibits duly elected county officials from negotiating with other transportation entities such as FDOT to fund new road capacity projects. How is that fair? All other county commissioners in Florida are negotiating with FDOT, etc about transportation projects. Don't the citizens and duly elected officials of Hillsborough County possess the same rights and privileges as those of other counties? Can those rights and privileges be lawfully taken away by AFT, a political committee? Below is some information excerpted from the Amended Complaint (emphasis mine). Article 11 was not drafted and approved by attorneys representing Hillsborough County or the State of Florida. Its content was neither debated nor voted upon by the BOCC. Although pursuant to section 212.055(10), Florida Statutes, a “performance audit” for Article 11 was completed on September 5, 2018, it did not address the issues presented in this complaint. Article 11 has never been determined to satisfy the Laws and the Constitution of the State of Florida by any Court. IOC is given the power to make findings of fact about the compliance of the Agencies with Article 11 and to enjoin constitutional officers from performing duties established by general law. These are powers of judicial review given by a county ordinance to a board of unelected private citizens in the absence of any provision in the Florida Constitution or Florida general law authorizing such power. Article V of the Florida Constitution expressly forbids the establishment of such a judicial power in the IOC. mandatory amounts of the surtax proceeds, coupled with conditions, limitations, and restrictions on the uses otherwise authorized by section 212.055(1) to be decisions within the sound discretion of the BOCC. This second subject of “Funding” is not only a separate subject, it is also, in its entirety, an unconstitutional restriction upon the powers given to the BOCC by the Legislature in section 212.055(1). the proposed Article 11 had two “chief purposes.” One chief purpose was to establish the transportation tax authorized by the Legislature. The other chief purpose was to establish a mandatory spending or appropriation structure for the tax proceeds that deprived the BOCC of the powers given to it by the Legislature, and that assured the tax money would go to fund the users and the projects that the citizens behind the initiative favored. Additional lanes and new roads are the types of projects that voters undoubtedly expected the new taxes to fund given that the first use of proceeds suggested by the summary is to “improve roads and bridges. Admittedly, the 75-word limitation applicable to the summary requires succinct wording, but the words selected confuse rather than inform the voter. Under the accuracy requirements essential for an adequate ballot summary for an initiative petition, the information provided to the voters was legally insufficient. The ballot language in this case is defective for what it does say and for what it does not say. Unlike the process for the proposed constitutional amendments by the Constitutional Revision Commission, which were prepared under the Sunshine Laws of Florida in February and March 2018 with adequate time allotted for the Florida Supreme Court to approve or reject them prior to the preparation of the ballot for the fall election, this petition was prepared in secrecy and there was less than 60 days between the date when the Supervisor announced that it would be on the ballot and the date when the Supervisor began mailing ballots to voters. Even if Mr. White had understood the problems with the ballot summary on August 8, 2018, and had had the resources to retain an attorney to file a challenge to the ballot summary, any lawsuit to challenge the ballot summary prior to the election could not have been resolved prior to the election. There is no legal prejudice caused by Mr. White’s filing of this objection to the ballot language at this time. The prejudice, if any, was created by All For Transportation’s decision to delay the petition process to the last possible moment. The fact that this action was filed a few weeks after the election, but prior to the effective date of the tax, is not a legal or equitable basis for governmental bodies to claim that the votes of citizens, who were given legally insufficient information at the voting booth, established “the will of the voters” to be burdened with an unconstitutional transportation surtax system. This is especially true of a fully mandated system that cannot be altered over the next thirty years by the vote of future members of the BOCC even if those future commissioners “deem appropriate” projects radically different from the uses mandated by the many sections of Article 11 that were never disclosed to the voters when they voted. Read AFT's ballot summary language, read AFT's 5 page charter amendment, read Florida Statute 212.055 and read White's Amended Complaint - the links are above. What AFT has intentionally attempted is shameful. 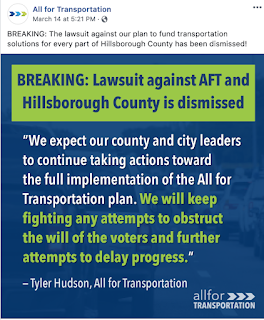 AFT and their wealthy special interests donors wanted all the power for how their $16 Billion tax would be spent for 30 years - billions on costly transit in Tampa and nothing on much needed new road capacity in unincorporated Hillsborough. 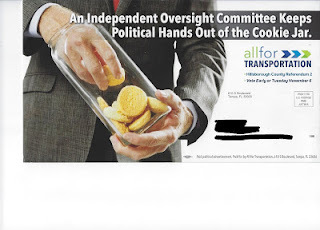 AFT created their transit tax hike scheme scam in the dark outside of Sunshine with no public input. Instead AFT consulted with special interests Tampa Bay Partnership who has been trying to pass a massive rail tax in Hillsborough County for over 10 years. AFT then deceptively sold their massive tax hike to voters as a "plan" to "improve roads" (but does not fund new road capacity) and reduce traffic congestion for which AFT provides no evidence to support such claim. AFT never even told voters their "plan" was a 30 year $16 Billion tax hike. 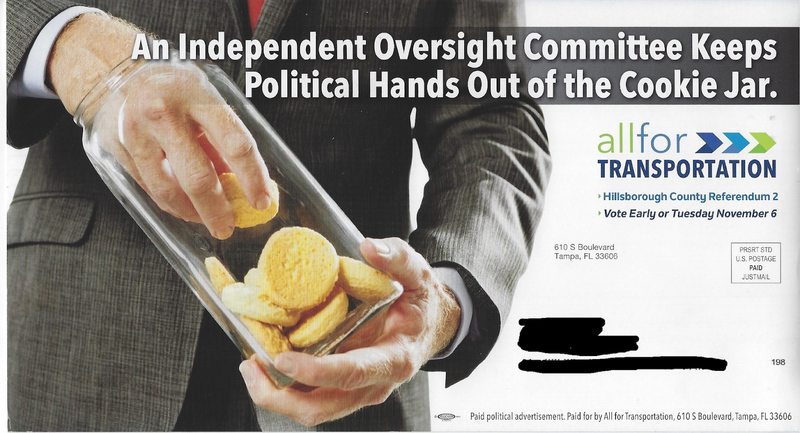 AFT never honestly told voters their massive tax hike forces taxpayers to spend to $7-8 Billion on costly transit in the city of Tampa but paid for by taxpayers in unincorporated. 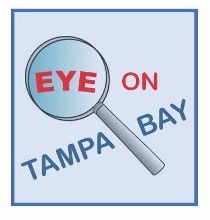 How does anyone in Tampa Bay ever trust again those major donors who funded AFT and those directly associated with AFT? It is obvious AFT did not have the language they used, both in the ballot summary and their 5 page charter amendment, properly legally vetted. The class action lawsuit (case # 19-CA-002483) filed challenging AFT's tax hike and requesting "a permanent injunction against further collection of the Surtax" can be found on the Clerk's website or here. With the Amended Complaint and the class action lawsuit, legal issues challenging the AFT tax hike appear to be growing. And the numerous legal issues are bigger than just Hillsborough County. The rule of law in the state of Florida must be upheld. There must be a legal remedy which prevents such big mess from ever occurring again in the state of Florida. 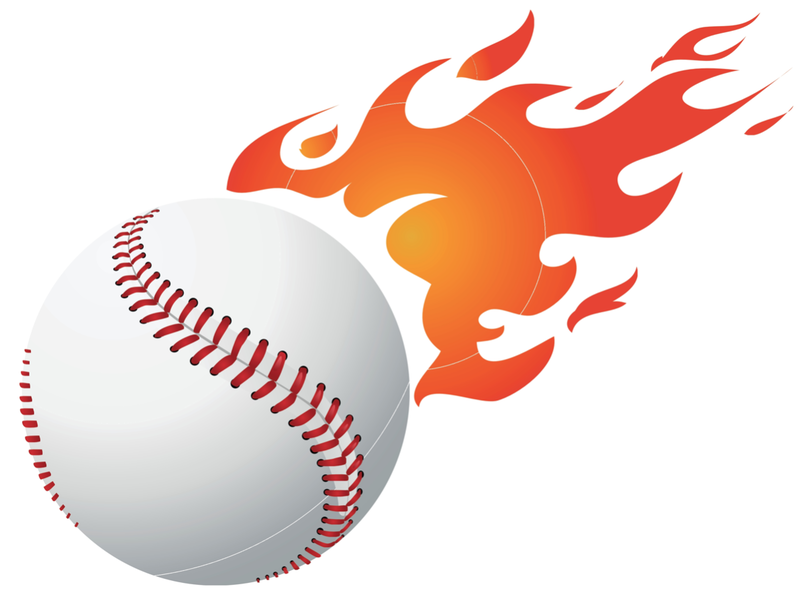 And we anxiously await to see where the latest curve ball thrown to All for Transportation lands and whether more will be forthcoming.